Posted on January 23, 2018 at 10:00 am. 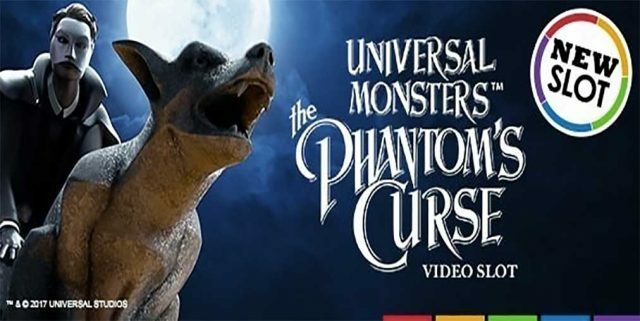 Net Entertainment is rolling out a new online casino slot Universal Monsters: The Phantom’s Curse this week and to celebrate you can get 50 free spins by playing at Slots Million. The online casino, which specialises in slots, has an exclusive offer for new players from Finland, Sweden, Norway, Germany, Iceland, Ireland, Luxembourg, Netherlands, New Zealand, South Africa, Switzerland, Austria, and the UK, where NetEnt games aren’t geo-blocked. Running between January 24 and February 5, players need to follow our links and create an account, if you don’t have one already, to qualify. If the ‘Register Now’ button doesn’t appear in the top right-hand corner, click on ‘Log In’ and a link to create an account will appear under the sign-in fields. When you sign up, be sure to enter the bonus code ‘PHANTOM‘ in the box, or you won’t be able to claim the bonus later on. Then deposit for the first time, and decide if you want to claim the 100 percent welcome bonus up to £/€/$100 (or currency equivalent). The great thing about Slots Million is players can receive several bonuses at once – withdrawing funds will void any active ones, though. When you deposit for the second time, you will receive the 50 free spins to use on NetEnt’s new slot The Phantom’s Curse. Winnings from the free spins need to be wagered 35x, which you can complete on NetEnt’s new game. Read the terms and conditions for more information on the turnover requirements, and other bonus rules. The anticipation for the Phantom’s Cure has been growing since it was supposed to be released at the end of last year. The cause of the delay is likely that Microgaming brought out a game featuring the same theme around the same time. While we had to wait, we can now play the 5 reel and 40 payline slot, featuring monsters based on Andrew Lloyd Webber’s musical. There is an eerie feel to the slot machine set inside an old theatre. It features standard gameplay, with a Pick and Click bonus round, where you can win cash prizes and multipliers. There’s also a Re-Spin feature with Stacked Symbols, and a Free Spins round with Wilds, Stacked Symbols and more, active until all five ropes break and the chandelier falls. The visuals and audio on this slot are superb and why we love Net Entertainment games. So if you’re based in a country where you can access NetEnt, get yourself to Slots Million for this exclusive bonus upon signing up to try out the new game.